On Sukhumvit Road – in direction to Sathahip coming from Pattaya – you pass the „Floating Market” and turn left at the next crossroad with a red light into Huay Yai Road. After several kilometers you will see Huay Yai City Hall on the left, followed shortly after by Huay Yai Temple with its impressive roof on the right. You follow Huay Yai for another 2 kilometers and then turn right into Huay Yai Chin Road, the road sign is written in Thai language only, but another sign shows: “Da Ne Vang”, follow it, you are on track. Very soon you cross over a bridge and shortly after (about 30 meters) turn left: There is another sign for „Da Ne Vang”. After about 300 meters you have reached Baan Leelawadee (149/7 Moo 6) on the right hand side, two small stone elephants are posted there. Ring the door bell or if the metal gate on the left is open drive in there. If you hire a taxi show the driver the Thai description. 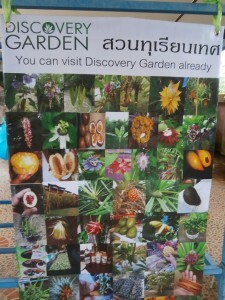 Discovery Garden is located about 15 kilometers outside Pattaya. Since there are no local taxis available in the area, make sure your taxi waits for your return ride. If you have any questions call: 081 2956227. Auf der Sukhumvit Road Fahrtrichtung Sathahip fährt man von Pattaya kommend am Floating Market vorbei und biegt an der nächsten Kreuzung mit Rotlicht links ab in die Huay Yai Road. Nach mehreren Kilometern sieht man links das Stadthaus von Huay Yai, dann folgt kurze Zeit später rechts der Huay Yai Tempel mit eindrücklichem Steildach: Von hier folgt man für zwei weitere Kilometer der Strasse und biegt dann rechts ab in die Huay Yai Chin Road: nur auf Thai angeschrieben, aber ein Wegweiser zeigt: Da Ne Vang, dem folgen. Kurz danach überquert man auf einer Brücke den Bach und biegt dann (langsam fahren) etwa 30 Meter später bereits wieder links ab (erneut dem Schild für Da Ne Vang folgen). Nach ca. 300 Metern befindet sich Baan Leelawadee (149/7 Moo 6) rechts, zwei Steinelefäntchen stehen vor der Einfahrt. Bei Fragen bitte 081 8441396 anrufen. Many thanks for spending over an hour with us showing your garden. 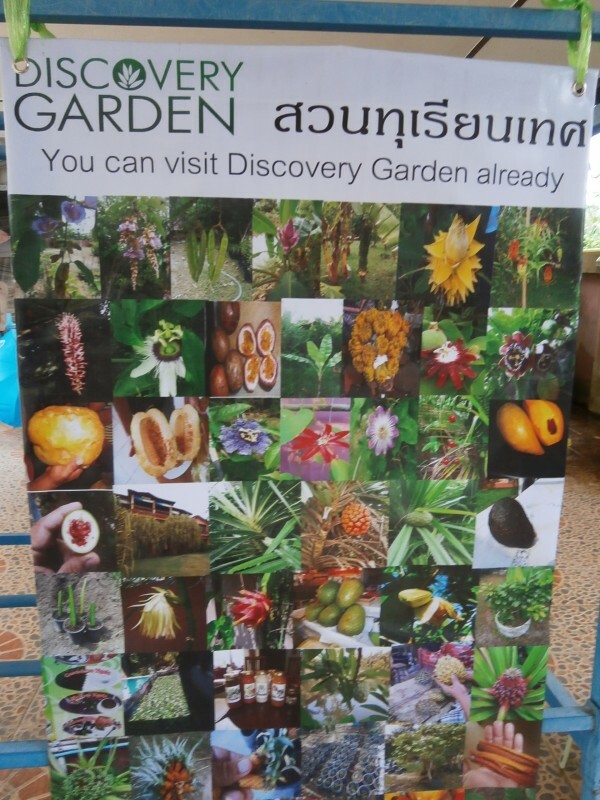 I was most impressed by the varieties of plants in your collection. Thanks also for the introduction in making of chocolate…and the delicious samples. We wish you the best of luck in your endeavor. Can you ship to the USA ? Hi, I am currently in treatment for prostate cancer. Will start Chemo Therapy next month. I am on the search for Graviola or Soursop products as these are proven efficient to heal cancer. I am at the moment in Pattaya. Do you have Graviola products for sale or know any reliable source for buying this products ? ich habe vor etwa einem Jahr auf dem Pflanzenmarkt an Ihrem Schwagerstand ein Feigensträuchlein erstanden. Zuerst ist es sehr gut gekommen, die Blattkrankheit habe ich auch weg bekommen. Seit etwa 3 Monaten ist das Wachstum zum Stocken gekommen und nur noch 3 Blätter sind vorhanden. With great surprise I came across your site. I started growing passiflora about 8 months ago and with hand pollination I now have about 4 dozen fruit on my vines. I am starting to have a bit of fungal (I think) problems and need some advice. If I were to call any day in say the morning could I come for a visit in the afternoon ? I live very close to you just off the Wat Yan Road in Huay Yai. My mobile is 081 916 1853. I look forward to meeting up with you. you may do as you propose, here is my number: 081 8441396.
you no longer sells at the market on friday , saturday , sunday..? your guys did a marvelous job, stowing all the trees on my pick up and securing them with the net. The plants arrived without any damage at my place where my wife now is planting them in huge pots to prepare the roots for the last move onto our land. All trees are looking healthy and I am in a good hope to get all thriving in our little Rainforest in 2-3 month. You added us a lot of variety and life into our little dream. Now I have my little Jungle again, just like in my childhood and I am looking forward spending hours and hours in it. Thank you for your time and detailed information about all we bought and sure we (especially my wife) will be back for a 2nd round.. Thank you very much for your kind words! We liked to have you, your wife and the other visitors in our garden. I shall be back in Thailand from June 23rd onward.